More and more, people are enjoying the flexibility of working from home. 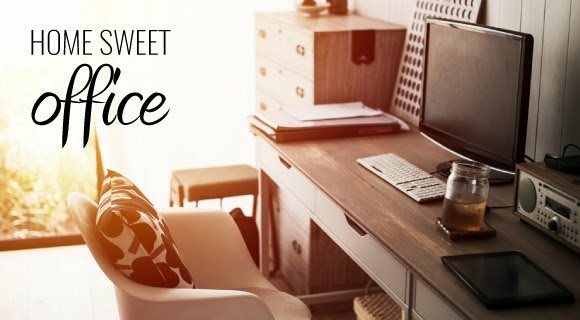 And while technology doesn't require you to stay tethered to a desk, you can certainly benefit from a dedicated space -- if only to block out the distractions of home life. Proper Ergonomics -- Whether you go all-out for a suite of office furniture or choose a simple desk and chair instead, your priority should be an arrangement designed to keep you pain-free. Adjust your chair so your feet touch the floor and keep your keyboard level with your forearms. Set your monitor an arm's length away with the top of it at eye level. Good Lighting -- You're not working in a cube, so why set up your space like one? Rather than face a dark wall, set up your workspace near a window so you can enjoy natural light. A task lamp provides supplementary lighting and a more focused pool of light than that from an overhead source. Abundant Storage -- A messy workspace can drain your productivity. Start by stashing pens, paper clips and other small items in drawers, or use containers to organize them. Move files into an easy-access rolling cart or file cabinet that fits under your desk or opt for wall-mounted storage. If your room has a closet, use shelves or a bookcase for additional supplies. Organized Technology -- Cord clutter is a frequent pain point for those who work from home. Keep your cords out of the way with a hook mounted under your desk. Then plug the cords into a single power strip on the floor. Labeling them with colored masking tape will help when you need to find a particular cord.